For the latest version of our Value Vacation Destinations CLICK HERE . Before we move forward in our continuing search for places that offer the best value in a family ski vacation, let's reiterate just what we're looking for. The "value" of a family is all about the quality of the experience, the overall sense of satisfaction and the creation of great shared memories that are most important. In judging a potential vacation for its value, we remind you to look at the big picture, imagine yourself in that picture, and try to best evaluate the fit. Keep in mind the qualities that make a family-friendly resort: ski terrain appropriate for everyone in the family; acceptable lodging (both type and location); half- and full-day ski programs; day care; and apres-ski opportunities. The destination should fit your family. And, remember, time of year directly affects cost and can affect snow conditions. Skiing at Thanksgiving will be cheap, but conditions might well be dicey. Skiing during Presidents' Week in February will more likely mean great snow, but at peak cost. The best value of all may be late-March and April: the weather warms, low season prices return and, because March is generally the month that brings the most snow, there's plenty of white stuff. Loon Mountain Resort, NH (www.loonmtn.com): a combination of a manageable size with sufficient terrain to please most abilities. Upside: plenty of alternative activities like tubing (including "extreme" tubing), snowskating, snowdecking, snowshoeing, snow cycling, sno-scooting, ice skating and horseback riding; on-slope, themed "adventure zones" combine snowsliding learning with environmental awareness through themed stories and interactive ski-through displays; good slopeside lodging; the town, Lincoln, has sufficient distractions to entertain off-slope. Downside: somewhat awkward trail layout; minimal truly expert challenges; limiting dining/diversion options at the base. Sugarloaf USA, ME (sugarloaf.com): A true big-mountain experience with small crowds and nice vacation packages. Upside: terrain for everyone; very friendly ambience and relatively user-friendly base complex; weekly schedule of family events; good childcare and lessons programming; excellent Nordic facilities; the Antigravity Complex offers 20,000-square feet with indoor skate bowl/street park, trampolines, climbing wall, basketball/volleyball courts, etc. Downside: remote location requires a long drive to reach; can get very cold way up there; despite chairlift access, it can be a long way from some condos to the slopes. Mount Sunapee, NH (mtsunapee.com): A user-friendly, low-key, mid-sized area set in a state park. Upside: approachable in size; friendly "local" atmosphere; good grooming; new children's center; spectacular lake views; single base area; decent parks and new superpipe. Downside: no on-slope lodging; limited true expert terrain. Jay Peak, VT (jaypeakresort.com): Jay gets more snow than anyone else in the northeast thanks to a phenomenon called Orographic Lift (no, we're not going to try to explain it - check their website), and their relatively remote location keeps the crowds small. Upside: user-friendly layout; spectacular tree skiing for all; excellent expert and adventure skiing; an 80-acre/4-lift "Beginner Terrain Zone"; a simple base area layout with adequate accommodations; accepts Canadian money at par. Downside: far away and can be cold; limited non-ski diversions; commitment to parks/pipes has been mild, but may be improving. Ascutney, VT (ascutney.com): One of the better small-to-mid-sized resorts for families. Upside: friendly; self-contained; excellent daycare and on-snow learning programs; family-owned; nice apres-ski kids' programming; free daycare or on-snow kids' program for one child per paid adult every day on non-holiday packages of four nights or more; good teen on-snow programming. Downside: minimal parks/pipes; limited non-ski activities and on-site shopping/dining; relatively few expert terrain challenges. Copper Mountain, CO (coppercolorado.com): Copper's terrain has long had all the big mountain allure, but it's only in the last season or two that its base facilities have made it a completely self-contained destination. Upside: superb terrain for everyone; newly expanded base village that offers most amenities and necessities; excellent daycare facilities and kids' programming; decent apres-ski diversions for kids, including a tubing hill; excellent terrain park that holds three skill level lines of hits running parallel to each other; kids' trail map directs little ones to on-hill kid-zones. Downside: village can be confusing; East Village can seem somewhat isolated from the main action; can be crowded on weekends/holidays; Beeline Advantage lift ticket program (gives priority at lift lines) considered controversial by some. Durango Mountain Resort, CO (durangomountainresort.com): We like this medium-sized (by Colorado standards, anyway) resort for its pleasant ambience and off-slope options; it caters best to intermediate skiers. Upside: friendly place; Durango offers some interesting diversions, but it's a bit of a drive; plenty of cruising terrain spread out over a long ridge line; good slopeside lodging; excellent off-hill options, including Mesa Verde National Park and the Durango-Silverton Railroad. Downside: base village not fully developed, and it's a ways to town; moderate parks/pipes commitment; limited expert terrain. Solitude, UT (skisolitude.com): One of Utah's "smaller" major destinations, a new and growing base village, and relatively inexpensive lift rates make this a "comer". Upside: a tidy and comfortable base village; excellent slopeside lodging; excellent terrain for everyone; combo ticket with Brighten available; reasonable pricing; quiet, uncrowded and relaxed atmosphere that's good for people who put a priority on the on-snow experience. Downside: no non-skiing daycare; limited off-slope activities (but Salt Lake City is 40 minutes away and accessible by public transportation); not the choice if you want lots of bustle, shopping and dining options. Brian Head, UT (brianhead.com): A small, pleasant eye-opener in a surprising location - just three hours from Las Vegas. Upside: small, user-friendly area without glitz; excellent daycare and kids' programming; quiet, isolated and not overbearing in any way; learning hill is separated from the main slopes; terrific amounts of snowfall; can be combined with trips to Zion National Park, Vegas and even winter golf in Cedar City; nice tubing hill; good commitment to parks/pipes; alternatives include ski biking, Nordic and snowshoeing; night skiing and tubing; affordable pricing. Downside: high elevation can cause problems for some; isolation and small base facilities mean a poor choice for bustle, shopping and dining options; nice terrain but not too much for the adventurous. Sun Valley, ID (sunvalley.com): One of North America's most venerable and historic resorts, it's got class, glamour, and a heavy dose of je ne sais qua. Upside: separate beginner mountain (Dollar Mt. ); super main ski hill (Bald Mt.) with terrain challenges and long runs for intermediates on up; superb and historic ambience, especially when lodging in the Sun Valley Lodge or Inn; Ketchum is an active ski town with excellent restaurants, galleries, etc. ; good low season package rates and kids-ski-free offerings; good air access from California and Seattle; good Nordic skiing on-site, superb stuff nearby; on-site skating, swimming, bowling, movies and more; wonderful on-hill lodges. Downside: can be difficult to get there from other than the west; snowfall has been known to be dicey; Baldy skiing can be challenging (many blues would be blacks elsewhere); mild commitment to parks/pipes. Kirkwood Mountain Resort, CA (www.kirkwood.com): Not far from South Tahoe's blazing neon lights, but a quiet retreat unto itself. Upside: huge amounts of skiing and terrain for everyone; pleasant self-contained base village of approachable size; excellent slopeside accommodations; good daycare, but only from age two up; nice non-ski activities selection, including tubing, skating, a snowskate park and snowshoeing; good commitment to parks/pipes. Downside: no daycare for infants; limited dining/apres-ski options; older lifts. Diamond Peak, NV (diamondpeak.com):With the addition of a new high speed quad, Diamond Peak's picturesque terrain will be that much more accessible. Reasonable family pricing make this Lake Tahoe resort a clear choice compared to some of its neighbors. 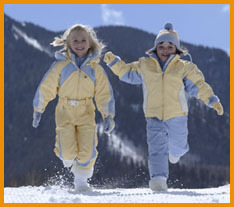 Day care, Children's Ski School and Sierra Scouts program all add to the package. Mt. Hood Meadows, OR (skihood.com): The place will surprise you - with its size, terrain and affordability. Upside: large amounts of terrain for everyone; good commitment to parks/pipes, including a new superpipe, a beginner park and a snowskate park; excellent daycare; good kids programming with children's learning center, a fun zone with carpet lift and interpretive nature ski trail; just an hour from Portland; inexpensive lift tickets when you buy lodging. Downside: no on-slope lodging, most lodging is in Hood River, 35 miles away; lacks apres-ski and non-ski options; primarily a day ski destination for Portlanders, (but it does have enough terrain for multi-day stays). As we said last time, with the monetary exchange rate being what it is, all of Canada is a great value. Please see 2002 for our favorite Canadian value destinations.